Admit it, whenever you see someone using their iPhone you’re always trying to sneak a peek of what apps they’ve deemed important enough to put on their homescreen, and what kind of wallpaper they’re using. 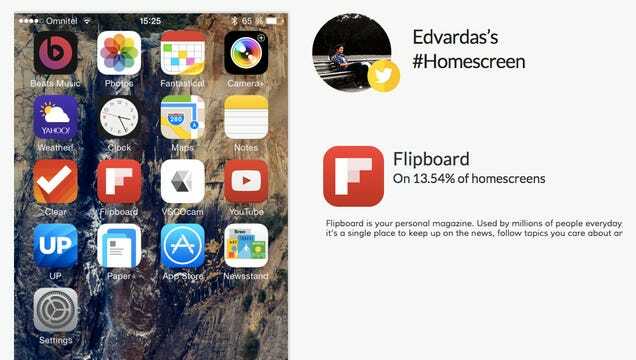 Now thanks to an iOS app called #Homescreen that allows users the world over to share and stare at screenshots of their diverse homescreens, you no longer have to be so covert about it. But it’s not just about peeking at how others organise their phone. The recently updated #Homescreen app provides a vast scrolling sea of iPhone screenshots to peruse, but you can zoom in on any one in order to see what apps a given user is using. And those screenshots are interactive, so if you see an app you’re curious about, each icon is actually linked to the app’s page on the iTunes App Store. So if you’re feeling guilty about staring at other people’s homescreens, don’t be. You’re actually just doing important research to help improve your own iOS experience.